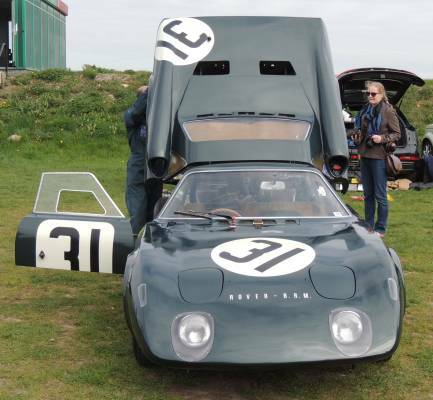 1963 Rover-BRM gas turbine. The open top car was set to average 93.2 mph. It ran with the number 00 as no official class could be agreed for it. After the rest of the field had left via the traditional start with driver running to the car angled at the side of the track "00" was flagged off seperately . Graham Hill and Richie Ginther covered 2582.96 miles at an average of 107.84 mph.The cars fastest lap was 113.62 mph by Ginther. They would have been 8th.if classified. Using this updated coupe version of the 1963 car Graham Hill and Jackie Stewart averaged 98.88 mph to finish 10th. overall, third in class and 9th in the Index of Thermal Efficiency. The addition of a heat exchanger helped the car to cover 2,370.7 miles in the 24 hours for the consumption of 176.5 gallons of paraffin - giving 13.52 mpg. 1992 BRM P351. Group C carbon fibre V12 48 valve 3.5 litre coupe. Director John Mangoletsi / Lead Designer Paul Brown / Engine by Graham Dale-Jones. Drivers Harri Toivonen / Wayne Taylor / Richard Jones (Eugene O'Brian originally entered but did not race). Retired after 20 laps with transmission trouble. Silverstone 500 Km. 10/5/1992 Ran out of fuel on Friday morning. Blew oil seal on first lap of qualifying. Stopped with flat battery after 7 laps on Saturday. Oil pump drive sheared during morning warm-up. Wayne Taylor / Harri Toivonen driving. 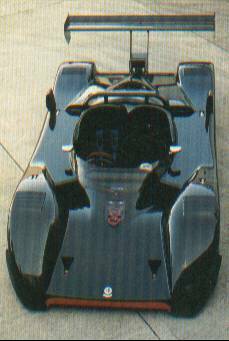 1997 BRM P301- LMP1. Prototype class open top car entered by Pacific Racing team of Keith Wiggins. The project leader, Ian Dawson, was testing with driver William Hewland at Snetterton as early as November 1996. Based on 1992 P351 Group C car but with a Nissan twin turbo V6 engine from Clayton Cunningham of the USA. The driver lineup was Harri Toivonen / Jesus Pareja / Eliseo Salazar. The car retired after 6 laps with engine trouble. Was raced occasionally in ISRS 1997-98.